Tower Villas condos in 2 sentences: Tower Villas is one of the original residences along the Orange Line and provides its residents with some of the largest floor plans in the area. While the building is a bit older, the community provides ample amenities and is just one block away from the Virginia Square Metro station. Area Amenities: Water & Wall, Oakland Park, Rockland’s, Giant Grocery Store, Tranquil Space, Arlington Arts Center, El Pollo Rico, Quincy Park, Central Library, Starbucks. 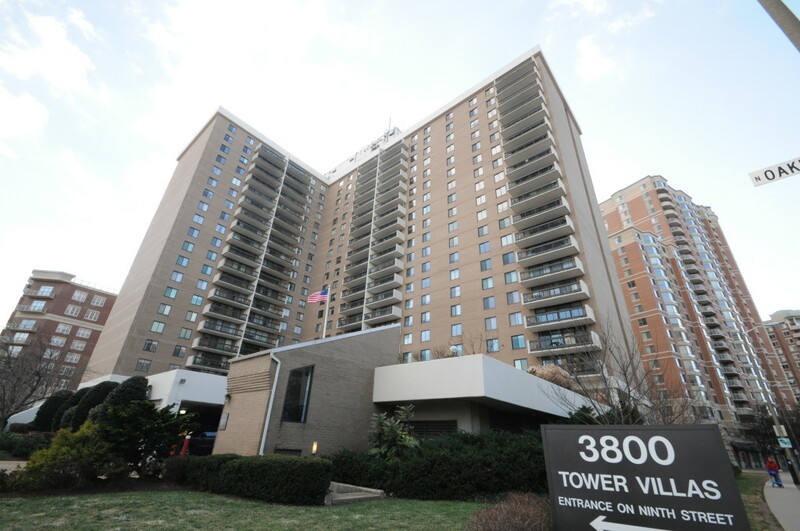 Tower Villas was built in 1974, stands 18 stories tall and has about 250 residences. It has a few distinguishing characteristics that set it apart from other condos along the Orange Line. Some potential residents take one look at Tower Villas from the outside or see the age of the building and immediately rule out the community as a viable living option. Those that choose to do so could be missing out on an opportunity to enjoy some of the perks that are not found in the newer communities in the area. To start, Tower Villas (the ‘s’ is silent) condo floor plans start at 940 square feet for one-bedroom layouts. The larger one-bedroom layouts are over 1,000 square feet. In Arlington, it is easy to find two-bedroom layouts that can be under 1,000 square feet, and even under 900 square feet. Tower Villas also features two-bedroom and three-bedroom floor plans. There are one or two condos in the building that have been combined to be even larger than three bedrooms, but for now, we will stick with the basic layouts. Expect two-bedrooms to start around 1,300 square feet, while three-bedrooms will be slightly larger. All two and three-bedroom layouts will come with two bathrooms. Another perk about living at Tower Villas is that all units come with a balcony. Balconies may seem commonplace until you start touring other Virginia Square condos for sale and come to the conclusion that they are a bit more rare than expected. Kitchens at Tower Villas Arlington VA are really going to be a mixed bag of those that have been updated recently, with those that have not been touched in 20 years. That is pretty normal for a building of this age. Some kitchen layouts will be closed off, others may have the potential to be opened up by knocking down a wall. You may also see the rare, updated and open kitchen layout. Lower your expectations for kitchens at Tower Villas. Expect to put some work in to your future kitchen here (and with this attitude, you may be pleasantly surprised with what you find!). The amenities at Tower Villas include 24-hour front desk, a fitness room, a courtyard, and an outdoor pool. There are some pros and cons to take away from the amenities. The biggest asset is going to be 24-hour front desk. This amenity is becoming an increasingly rare commodity in condominium communities. Another take-away is the fitness room is quite small. For a condominium of this size, you would expect the fitness room to be a big larger. That being said, Gold’s Gym is a 3-minute walk away. Finally, the outdoor pool at Tower Villas is one of the largest in the area. Maybe only the pool at The Belvedere in Rosslyn can match the size of Tower Villas’ pool. The Tower Villa pool is quite impressive. Besides, what’s a Villas without a nice pool? The best thing aspects about living at Tower Villas are the large floor plans, the large balconies that come with every unit, the outdoor pool, and the location. The downsides are the high condo fees and the ambiance. The condo fees include all utilities and a plethora of amenities. The value is there for some, but if you do not place value on things like 24-hour front desk, outdoor pool, etc…the fee may seem a bit outrageous. As for the ambiance, certain parts of Tower Villas are not as updated as some would like. It has an older feel to it. Maybe a renovation of some commons space could be in the works. If you take a look at Hyde Park in Ballston, the community (which was built around the same time) recently renovated their lobby and now the community presents itself significantly nicer to prospective residents than before. Tower Villas might want to follow in Hyde Park’s footsteps by updating the common space to give off a more modern ambiance. To summarize, Tower Villas is an older building with huge floor plans and a full list of amenities in a great location. With any older building, there will be some downsides that come with the territory. But those that see the value in Tower Villas enjoy features about their living space that newer buildings will never be able to match. If you are tired of shoebox condos, are in need of more amenities, or are looking for something a little bit different, Tower Villas may be right up your alley.